For the first training hike Ben targeted Mt. Tom which overlooks Crawford Notch in New Hampshire. It is about 5.6 miles round trip with an elevation gain of 2,180 feet. The goal for this hike was 3 hours and 25 minutes. For this trip our crew consisted of Ben, Alison Trina and myself. 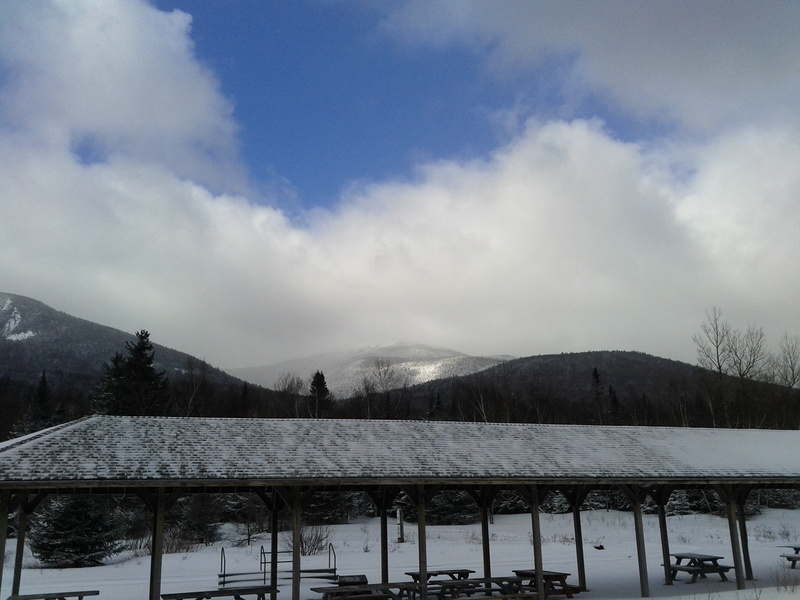 We arrived at Crawford Notch and were greeted in Crawford Notch with chilly temperatures in the low 20s with a cold breeze and mostly cloudy skies with snow squalls blowing through. It was pretty apparent that the Notch had received a fresh coating of snow with 4-6 inches of fresh powdery snow on the ground. After gearing up, we started up the Avalon Trail at 10:00 AM and made our way up. Mt. Tom is a pretty popular trail as it is very close to the AMC Lodge in Crawford Notch. It is also one of the smallest of the New Hampshire 4000 footers at 4051 feet. As such, the trail was pretty packed down save for the inches of fresh new snow, but even that was light and powdery and easy to plow through. This was a good sign for our pacing as it is much easier to move faster when not breaking new trail. I opted for my snowshoes instead of traction figuring that with the increased foot print and expanded traction, I would be able to move more reliably than if I just had my microspikes. The Avalon trail starts off as a very light grade and it was pretty easy to make good time. At 1.2 miles the trail meets up with the A-Z Trail. At this juncture you can continue going on straight up to Avalon or bang a right and head to Mt. Tom. From here, Mt. Tom was 1.5 miles away and this is where the trail started to pick up a more moderate grade. At this point, Alison turned back as she is still rehabbing from a knee injury and did not want to push it. Ben, Trina and I carried on with me still leading the pack for most of the way trying to set the pace. One key factor for me was that I had not wanted to check the time or the stop watch as I wanted to see how I would do if I were setting the pace at something that felt right. Would I be faster? Would I be slower? I felt that being the first hike this was an important gauge to see what I thought was a fast enough pace. As we continued on up the path we were playing leap-frog with a few different groups of hikers. During the winter it is sometimes nice to see other groups on the trail because it means that the trail is packed down, which in turn makes it much easier to travel through the snow. It is also nice to stop and talk with other people on the trail and learn about where they are from and share the experience with others. However on a day when I was more concerned with keeping a steady pace, this was at times a hindrance and caused a few delays where we had to slow down or stop to wait for the group in front of us. The mile section of the A-Z Trail leading up to the Mt. Tom spur proved to be the biggest challenge of the day. It seemed relentless at times. But throughout it all, I kept my focus on moving forward and taking even, rhythmic steps. I even took a page from my yoga teachings and in matching breath and movement would synchronize my breathing with my steps forward to help generate a well-balanced rhythm of movement. It was not until the last ¼ mile where I finally started to feel it in my legs and my calf muscles – that old familiar feeling of burning, tired muscles that want to slow down and not move forward anymore. A few pauses and some concerted effort, however helped pull me up that last stretch and we landed in the col between Mt. Field and Mt. Tom where the spur to Mt. Tom takes us to the summit. The Mt. Tom spur was only a half mile and was, thankfully, relatively flat with only a couple small steep parts. When we got to the summit we caught up to two groups that were ahead of us including one that was from Tufts as part of their Outdoor / Mountain Club where the student leaders were taking a crew of students up who had never been winter hiking before. At the top, we took in the views – of a clouded in summit that obscured the surrounding peaks. Despite some smattering of sunshine, it was largely cloudy and blustery with snow squalls blowing in and out all day. We chatted with the Tufts crew for a bit and then had our lunch with a victory toast and nod to the gods from the flask. Heading back down, after spending too long at the top at 25 minutes, was where I hiked probably faster than I had before. It took us 2 ½ hours to get to the top and just over an hour to get back down. On the way down it occurred to me that I really need to improve my stride. I find that I often will take shorter steps on the way back down – this is especially true while in snowshoes. However at 6’5” I have pretty long legs which are strong and I need to remember to use my long, powerful stride to my advantage. Once we got down the steep section of A-Z Trail and back on to the Avalon Trail it was accelerator time and I felt like we were moving really fast. With the gentler grade, the packed down trail and focusing on powerful, long strides I was covering a lot of ground quickly. Overall it took us 3 hours and 59 minutes. 34 minutes over the time limit. But given some unplanned delays on the trail with a longer than anticipated lunch at the top, we felt very confident that we met the overall spirit of the goal. The best part was that I actually felt okay with the pacing throughout the hike. It will be interesting to see what happens in future hikes with different terrain and so forth. And in many respects, especially on trails like this, you can actually move faster over snow than you can during spring and summer hiking. So while I could not be more pleased, I know that there is a lot more work ahead of me. This week will bring some more reading on the White Mountains and training in the form of yoga and running. And then it will be time to plan the next hike. This entry was posted in Hikes, Training and tagged Hiking, Mt. Tom, Presidentials, Snowshoeing, Training, White Mountains. Bookmark the permalink.